I have to confess, I’m kind of a bread addict. I love any kind of bread, from tender and flaky biscuits, to french breads, to pillowy soft rolls. My very favorite kind of bread, though, is a fluffy white loaf of homemade bread. Years ago, I taught myself to bake perfect bread, and it has totally changed my life! I make most of my family’s bread these days, and I love that it not only tastes better than store-bought, it’s also super easy and makes me feel accomplished. As long as you plan ahead a little for rise times, it’s really not very much work, and well worth the effort. I have to confess, though, I was terrified to try making bread for the first time all those years ago. I had several failures in a row, and was convinced that I would never master even a basic loaf. Have no fear, though! I’m here to share all my best bread-making tips with you and show you that this is an easy bread recipe. It’s really a simple process, once you get a feel for it, and in no time, you’ll be a bread baking expert too! Once your yeast is bubbly, you’ll add just a few more basic ingredients to form the dough. I’ve found over time that my favorite bread recipes are those with the simplest ingredients! The key at this point is to not add too much flour. It definitely helps to add the flour a little at a time. I like to add a little over half of the flour at first, then add the remaining flour 1/2 cup at a time, until the dough reaches the right consistency. It’s easy to add more flour, but pretty much impossible to correct when you’ve added too much. You’ll want a dough that’s smooth and slightly tacky to the touch, but not overly sticky, and that can be easily rolled into a ball. You’ll let the dough rise for an hour, then divide it into two equal size balls. I’m neurotic, so I always use a kitchen scale to make sure they’re the same size, but you can definitely just eyeball it! Roll each ball of dough out into a long rectangle about eight inches wide, then roll up into a cylinder starting at the short edge. I’ve found that rolling the dough up this way really helps with the texture and shape of the finished loaves. Place the loaves seam side down into two bread pans, cover with plastic wrap, and let rise again for about an hour. The dough is ready to bake when it has puffed up over the side of the pan about 1/2 – 1 inch. Bake 30-35 minutes, or until the loaves are golden brown and sound hollow when tapped. I like to brush my loaves with a little melted butter after baking, but it’s totally optional. I like that it helps to soften the top crust just a little, and a little extra butter is always a good thing, right? Letting the bread cool before slicing makes it easier to get smooth, uniform slices (although I’m often so hungry for warm bread that I eat it hot anyway). How to store homemade bread? Let the bread cool completely and place in Ziploc bag or wrap in foil. The homemade bread should last 2 to 3 days stored at room temp. 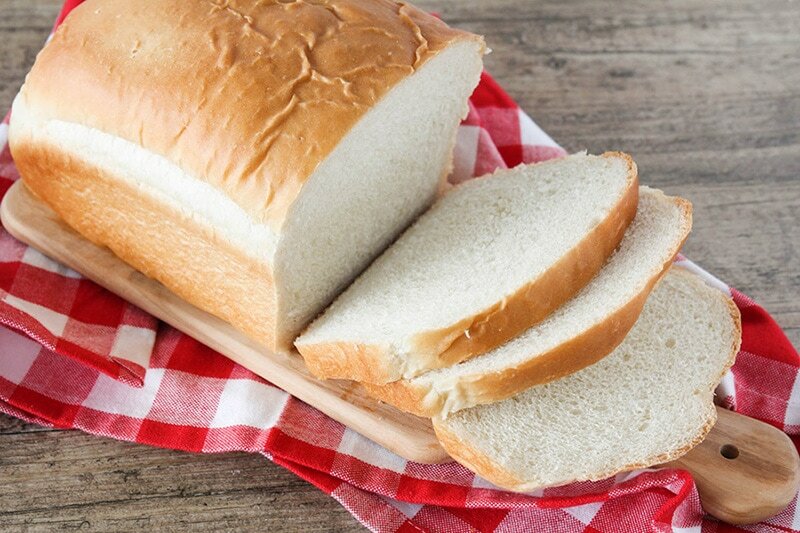 How to freeze homemade bread? If you’re wanting to save the bread for later, it freezes beautifully! I like to slice the loaf all the way through, place it in a plastic bread bag, and freeze it as soon as it has cooled completely. To thaw it, just pop the loaf in the fridge for a few hours. 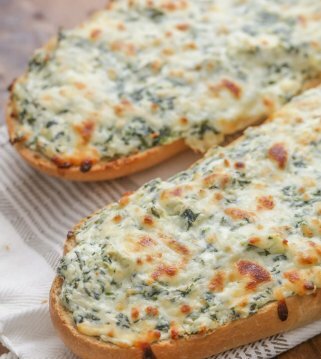 I love that I can pull out a few slices as needed for toast, or pull out a full loaf for soup night or when I’m making sandwiches for school lunches. How to make bread crumbs from homemade bread? Let the 1 loaf of bread dry out and become more firm. Then use a food processor to blend the crumbs evenly – do not over process. Melt 1/2 cup butter in a large pan and add the crumbs along with some salt and pepper – stir until evenly coated. Keep stirring until crumbs sound like sand. Let cool and store in Ziploc bags with zipper seals for up to 6 months! How to make croutons? Check out our Homemade Caesar Salad Croutons recipe! 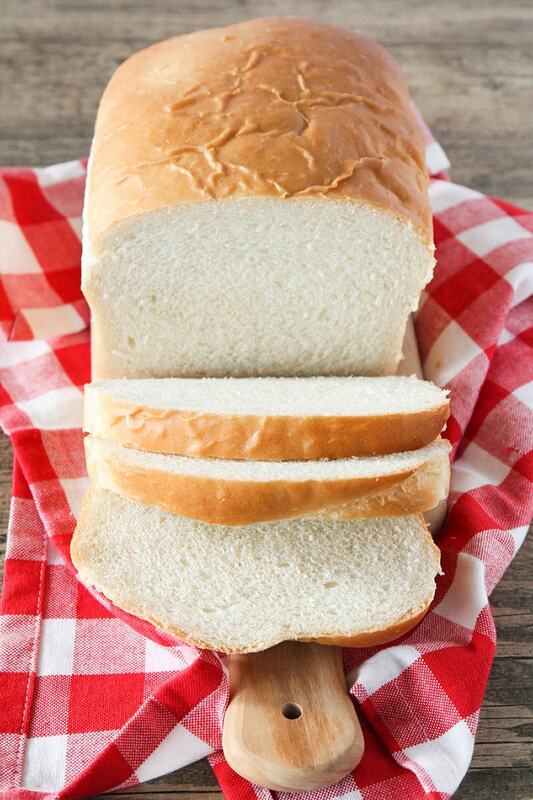 This white bread recipe is so soft, tender, and flavorful. It’s everything that white bread should be! My favorite way to eat it is warm from the oven, smothered with fresh honey butter. Yum! Even if you’re a bread novice, you should definitely give this easy recipe a try! Basic Homemade Bread - the best, most fluffy loaf of homemade white bread! Tastes so much better than store bought!! 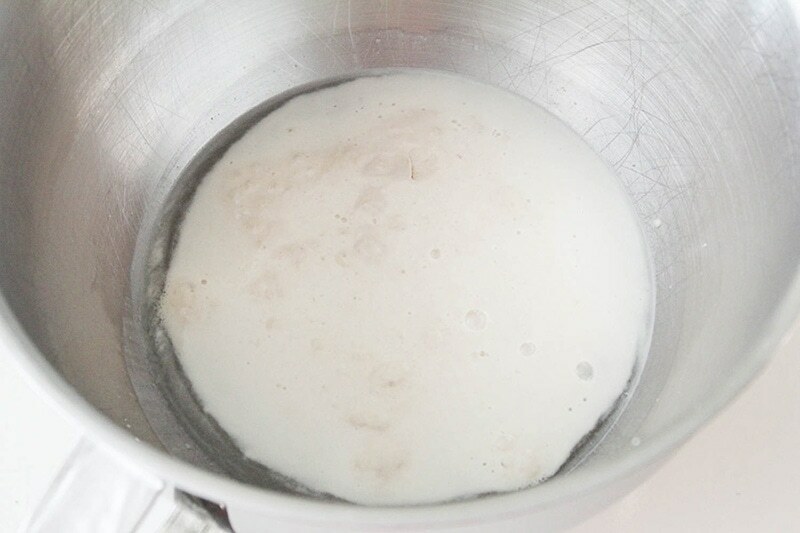 In a large bowl or the bowl of a stand mixer, dissolve the yeast in the warm water with a pinch of sugar. When the yeast is bubbly and foamy, add the sugar, salt, oil, and 4 cups flour, and mix until smooth. Add remaining flour, ½ cup at a time, to form a soft, smooth dough. The dough should stick just slightly to your finger when touched, but not be overly sticky. Knead 5-7 minutes, until smooth, then roll into a ball. Place the dough in an oiled bowl, turn over once to coat the top with oil and cover with plastic wrap. Let rise one hour, or until doubled. When the dough has risen, punch it down gently and divide in half. 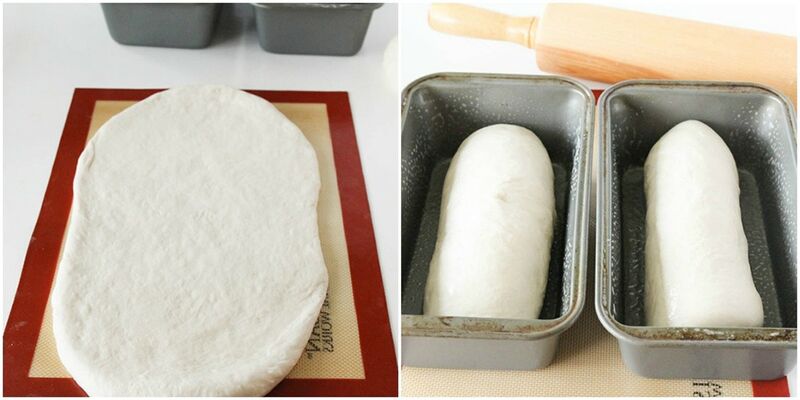 Roll each half of the dough into a long rectangle about 8 inches wide. Roll the dough up, starting at the short edge, to form a cylinder that is approximately 8 inches wide. Repeat with remaining dough. Place the dough, seam side down, into lightly greased bread pans, and cover with plastic wrap. Let rise one hour, or until the dough is ½ - 1 inch higher than the top of the pan. Preheat the oven to 375. Bake 30-35 minutes, or the loaves are golden brown and sound hollow when tapped. Brush with melted butter, if desired. Remove to a cooling rack and cool before slicing. MAKES 2 LOAVES. For more delicious recipes by Alicia, head on over to The Baker Upstairs. What kind of flour. Self rising or all purpose or bread flour? Could I use self rising flour in replacement for the yeast? Oh, I haven’t tried. Not sure I would risk it. You could experiment, but honestly, I am not sure how it would work. You use all purpose flour, but what brand is it? If I wanted to freeze one of the doughs for later use should I do that after letting it rise the first time or what do you reccomend? I personally haven’t put the dough in the freezer. My mom always taught me not to, so I’m not sure what to recommend. Has anyone put it in the freezer? Freeze it after the first rise. Gently punch it down then freeze. Let it thaw in the pan on the counter. When it has thawed and rises then bake. Thank you Janice for sharing!! I would suggest baking the bread and then freezing it. With the exception of pizza dough, I haven’t had a lot of success with freezing dough. If you do want to do it, I would do it after the first rise. I put the loaf in the pan and put the pan the freezer just long enough for it to be solid and not rise anymore. Then I pop it out into a zip lock bag. When I take it out it fits in the pan and I don’t have to fight with it. I just let it thaw and rise and pop it in the oven. Thank you so much for sharing that Missie! I agree with this. Actually what I do is bake the two loaves and cut one into slice for toast and freeze that one, because it’s so much easier to pull out a few slices to toast than to thaw a whole bread. Then we consume the fresh loaf throughout the week I bake it for fresh sandwiches etc. Your bread looks wonderful! 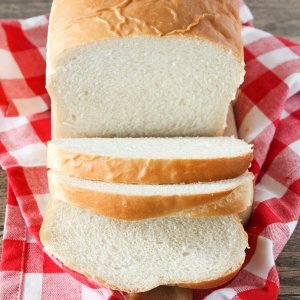 I was wondering…After the bread has cooled and a few slices have been eaten, what is the best way to store the bread for a couple days besides putting it in the refrigerator? For example, some folks wrap it in a tea towel or put it in a storage bag etc.etc… Any tips? Thanks!! I made this bread for my wonderful husband and he liked it not bad for my first try I will make this bread again it was easy and taste wonderful. Thank you. ???? Oh, I’m so glad!! Thanks so much for giving it a try and letting me know! I just made your bread and it turned out great!!! I will definately make this again! Oh, I’m so happy to hear that!! Definitely a good recipe 🙂 Thank you! I tried this bread recipe this week, and I was amazed at how easy, and how wonderful this bread is! My husband loves it, and oh the sandwiches made with this glorious bread. Even a novice like me can do it! Thank you! Yay!! SO happy to hear that! Thank you! Can this bread dough be used for cinnamon rolls, or should I use another? I didn’t know how long this would stay moist and tender. The bread went so fast, it was difficult to say!! Tried it for the first time tonight and couldnt help but eat it warm right out of the oven. Sent pictures to all my freinds too. Braggers rights were acheived with this recipe! Thanks for sharing. Its a great recipe! LOL..brag away 🙂 I’m so glad you like it and eating it warm is the best way!! Thank you! Do you just have white bread or is there a wheat version? I don’t have this same version for wheat bread, but I do have a wheat bread on the blog, that you could try…https://lilluna.com/honey-whole-wheat-irish-soda-bread/. Hope that helps!! Thanks for stopping by! I didn’t have enough all purpose so the first time I made this bread, it was 4 c all purpose and 2 c whole wheat. My husband said to always include the wheat because it was so good! You could start there and keep experimenting with taking out more all purpose. This looks soooo good! Thank you for sharing! We just moved out to the country about 6 months ago and one of our neighbors (who lives about 5 miles away lol) is a sweet older couple and she made us some homemade bread and rolls as a “Welcome to the country” gift and my kids and husband loved it!! The whole loaf was gone in 2 days. So I’m making this recipe tonight for the first time! Fingers cross!! How fun..what country? I hope it turned out!! Let me know! I have a question, when go to dissolve the packet of yeast do I add it to the full 2 1/4 cup of warm water? I know that might seem like a goofy question since it’s clearly posted above, I was just asking because when I just tried it….it wasn’t very bubbly (a few bubbles but not a lot) I didn’t know if I added all the water too soon because on the back of the package it says dissolve in 1/4 cup of warm water. Just want to make sure I’m going it right. Thank you. Yes, dissolve the yeast in the warm water with a pinch of sugar and let it bubble for 10 minutes. Just make sure you have fresh yeast (dry active yeast). Hope that helps and let me know if you have more problems. Good luck! I just looked at your video and it seems like you didn’t add 2 1/4 cup of water to the yeast. It was 1/4 cup. Is that right? I’m so confused on the measurements. Trying to make it right now. Much water and the yeast does nothing. Is this right???? It is right. The yeast normally bubbles & you know it is active. If it doesn’t do anything, then you know to try again or get new yeast. I hope this helps. Try getting new yeast & make sure it is warm & that it bubbles. i had problems using the full amount of water you wanted, so i Just used the 1/4 C. recommended to let the yeast rise and then when mixed in the other 2 cups of water as i mixed in some of the flour (i added the flour cup by cup) and the bread turned out great! I made this in my apartment, all my bread pans I had left at my grandmothers. It works fabulously as a braided loaf, or as a simple round loaf. This bread is the best! !!! I use it as a base when I’m making other breads too, rye, cinnamon raisin , it’s delicious! !!! Everyone I share it with lines it too!!! Thank you so much for sharing that recipe and letting me know! Those all sound wonderful!! What recipe do you use for raisin bread? Can you list the brand of yeast you used? I am using active dry yeast packets but they aren’t foaming at all ???? I used Red Star Yeast. Make sure your water is warm and give it a pinch of sugar to feed on. If it’s still not foaming, it’s not good yeast. This is Alicia from The Baker Upstairs recipe. 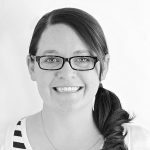 Here is her link, if you’d like to ask which yeast she used….http://www.thebakerupstairs.com/. Hope that helps! I personally haven’t, but I’m sure you could! I’d love to know! Thank you for stopping by! Hello, I am just starting my adventure in baking bread. So my question is, did you use a hook attachment to knead the dough for the 5-7 minutes or by hand? Hi. Can’t wait to make. Can you tell me about how many calories? I just worked it up for myself and came up with roughly 1365 calories per loaf. I haven’t baked it yet, so I’m not sure how many slices this will end up yielding me. Thanks for sharing! This is now my go-to bread recipe, and I’ve probably made it once a week for the last two months now! It turns out perfect every time. I’ve also made garlic bread and cinnamon raisin bread using this recipe as the base, and both have been excellent. I’ll slice them and pop them in the freezer, then reheat in the toaster. I’ve started making one plain loaf and one flavored loaf each time. 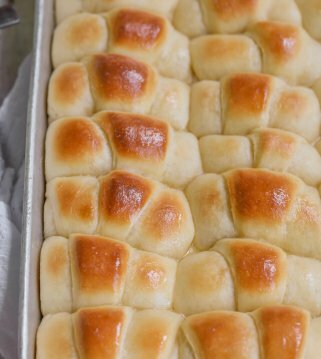 I have a batch rising right now, and may try to make dinner rolls from it today. That makes me so happy to hear!!! Such great ideas!! Thank you so much for sharing!! I honestly do not know. I haven’t tried that. I wish I knew how it would change the recipe. I’m sorry! I’ve made this recipe for a few months, I’ve always used bread flour. I’m at a high elevation so I’ve had to tweak the water/flour ratio but the loaves are always delicious! Thanks so much for sharing!! Glad you like it! I’m in Colorado and have had the hardest time getting the flour/water mixture right for the high altitude!!! May I ask what you do that works? SO what i do is a little different from this recipe, altered for the ALTITUDE we live at (6,100 ft) on the western slope. I use 2 cups of water, between 105-115 deg F. I dissolve the 1/4 cup of sugar into the warm water. I then add in my yeast, 2 tsp. Currently I’m using Fleischmann’s Bread machine Instant yeast. I’ve also used Kroger packet yeast. I like them both, but the jar of instant yeast works a little better in my opinion. The key for me was the temperature and sugar. without checking the water temp with a thermometer my yeast was falling and my dough wouldn’t rise. My yeast DOESN’T seem to get very “foamy” no matter what i do/try. but if it doesn’t fall then i get good loaves. I have to use much more flour than called for, about 5 1/2 cups. I add 4 cups and then slowly add more until i get the dough CONSISTENCY. Very little kneading, maybe 2 minutes. I have tried bread flour and regular white bleached flour- white flour worked just as well so i now use solely that. I use a colorado company, Blue Bird Flour (kroger carries it in the baking section). Thank you so much for sharing that, Allison!! I am not too familiar with cooking in higher altitude, so this helps! Yes it works just fine. I only use bread flour as it has more gluten. Have you doubled this recipe? I’m just curious because my family goes through bread like crazy and when I make one batch, it doesn’t last us very long. I’m wanting to make enough to last a few days not just one or two. Also, have you tried to freeze it? Did it do well with being frozen? I have not tried freezing it, I’m sorry. It’s usually gone so fast or we give some away. Has anyone else tried freezing it? I’m going to be making this, it looks amazing! I just learned to make cinnamon rolls and noodles, and this recipe is next. My question IS…Will there be any difference with the quick rise yeast? Only because that’s what I have on hand at the moment, I sent my daughter in law to buy yeast for me, and she thought it would help to have instant. Bless her HEART..Anythjng to worry about? It should be ok 🙂 I haven’t tried with other yeasts, but I think it should be OK! I was so off on my timing and I had to leave the bread to rise for 3 hours before I can begin to roll it out / bake it. Will this ruin the texture? How did it come out? I’m sorry I couldn’t get to your question sooner. I haven’t let mine rise that long, so I’m curious. Thank you!! Hope you liked it! It was ok! It tasted really sweet and doughy. It was edible, but something was off. I’m going to try the recipe again now, knowing I will follow the recipe properly!! Yes, please let me know 🙂 I’m sorry the first time, something was off. I had to let mine rise for about 5 hours after putting into the tins because the power went out – I patted them back down and then baked, and they still tasted perfect! Oh, I am so glad they turned out! Darn power! Thank you so much! This is a really good recipe! I do love the simplicity of it and so does my family! Thanks for sharing, but I do have a question! For the flour measurement do you know how much you’re using per cup of flour? I use KA flour and 1 cup is 120grams, but the dough still seems a bit wet at time. I feel as though in may not be using enough flour at times. Any input would be greatly appreciate! Thank you so much for sharing this recipe with the step by step. I made probably my 8th loave. This recipe always turns out great. Oh, thank you!! I’m glad I could help 🙂 It truly is the best! Hi! What kinda of oil do you use. This may be a silly question but I’m not sure. Thanks!!! It’s vegetable oil 🙂 Not a silly question! Good luck! This is a great bread recipe. I am a lazy baker and I used the dough cycle on my bread machine to get through the first rise. (following machine recommendations of water, oil, sugar salt then flour and finally yeast) It would not have worked to bake it in my machine as it is too big a loaf and almost overflowed my machine. But that isn’t a problem as I prefer to bake in the oven. You are so welcome!! I’m glad you like it 🙂 Thank you for letting me know! Love tot hear so. I am defenitely gonna try it in my breadmachine. Have tried a lot of recipes. I made this bread for the first time yesterday and it was sheer perfection. It’s a beautiful recipe and SOOO EASY! 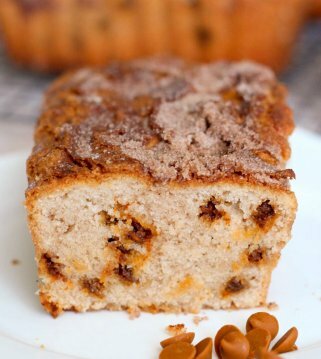 I will incorporate cinnamon, raisins and brown sugar to make a cinnamon-raisin brown sugar swirl bread. I find that brown sugar offers much more flavor and moisture to the bread. Thank you for this amazing recipe! Yay!! I’m so glad! And, yes, there are so many different things you could add. Thanks for letting me know! Can i possibly use milk instead of water? I’ve have never personally tried using milk. I’m not sure how that would change the recipe. I’m sorry, I wish I knew! It will be fine using milk instead of water. The crust will Be softer. You could use half water and half milk too. This recipe looks great! Out of curiosity, do you think you could switch the flour out with gluten free 1-1 flour? I personally haven’t tried. If you have used it and know if & how it might change a recipe, then I would say use it. I haven’t used gluten free flour enough to know. If you try it, let me know what you think 🙂 Thank you! No worries! You dissolve the yeast in the 2 1/4 c warm water 🙂 Hope that helps! Let me know how it comes out & good luck! Would it turn out differently if I used wheat flour instead? And I only have one loaf pan. Can I set aside one half while the other bakes? I haven’t used wheat flour with it, so I honestly don’t know how it would come out. Has anyone else used it? And, I haven’t baked them separately, so it should be ok. Not sure how the rising will be, since it is longer. I’ve baked my seperate and have also let it rise all day as I forgot about the dough. They both turned out so good! I have another batch rising right now. I’ll be trying wheat flour and other flours and if they turn out as good as this white flour then I don’t think I’ll buy bread ever again!! I’m so glad to hear that! Thanks so much for letting me know! Made last week.I replaced 2 cups of flour with wheat flour(half and half) and it turned out really good. Husband raved about it. Making bread again today using regular recipe. Can’t wait for it to get done! Also wondered if this recipe would work in a bread machine? This may be an obvious question but I’m making bread for the first time! Does it need to be covered while resting?? I cover with a terry cloth or just a light kitchen towel. Hope that helps! I made this today (except i used the quantity to make one loaf) and i was pretty happy. Hopefully the kids like it,they arent keen on breadmix/maker breads so hopefully this recipe/baked wins them over. I hope it does win them over! I’d love to know what they think. Thank you! Wonderfully easy for my first try at bread making and absolutely delicious! Thanks for sharing ???? I am so glad!!! I love hearing that 🙂 You are so welcome and thank you for letting me know! Do you put both loaves in together? I don’t have a convection oven so I worry that something will be messed up if I bake them together. I usually bake them together, but if you are worried, you can bake them separately. Hope that helps! I made this bread recipe last night, and it came out perfect!! I was wondering if instead of making loaves of bread if you can make dinner rolls out of this dough? I don’t see why not, though I have never tried. Let me know, if you try! Thanks so much! I loved it. You made it so easy for everyone. The texture of the bread is adorable. First time making bread and it came out perfectly!!! Thank you!!! Oh, I am so glad to hear that! Thanks for giving this recipe a try! I followed the recipe to the letter, but my dough is like cake batter. What did I do wrong? Haha..that happens! Let me know how it comes out 🙂 Thank you! I love this recipe! What is bugging me is the way this post shows an image of 2.5 out of 5 stars, but says it has a 4.9 rating from 11 (now 12) reviews. (Guess I’m a little neurotic too.) 😉 Thanks for the easiest bread recipe that tastes good too! You are so welcome!! This is our favorite bread! Thanks for trying it! I modified the recipe and made a batch of 12 onion buns and 2 loaves. For the onion buns i added celery salt, poppy seeds, and minced garlic before adding the flour, let it rise, made caramelized onions and added it on the last rise. TURNED OUT AMAZING. The buns are extremely fluffy and have great texture. Waiting for the bread to cool so I can slice it:) Thank you so much for sharing your recipe. You are so welcome and thank you for sharing your idea! Sounds great! So my husband tried a bread recipe yesterday and the bread came out quite heavy and the outside was a bit crunchy. It was nice and soft on the inside. Today though, I decided to make bread while he was at work to see how a different recipe would work out. Presently the bread is in the oven baking and I will update after its done. Recipe was fairly easy to follow, I however used lukewarm water instead of warm water. It got frothy in an instant! Only difference I’ve noticed is that my dough isn’t as smooth as yours in the pan. I used a bottle of wine to roll the dough, can’t find the rolling pin! Lol! LOL!! I hope you like it! I’d love to know 🙂 That’s awesome that he tried! Thank you. It’s my fav!! Thanks so much for letting me know and for the 5 stars! So glad it turned out for you! Thanks so much for letting me know! You are so welcome!! It absolutely is yummy! Let me know what she thinks 🙂 Thank you! I love this recipe! It is simple and my kids absolutely love it!! Is there anyway to make the dough and freeze it? I haven’t done that, but I believe others have said they have & it turned out. I wish I could personally tell you from my experience. You could try with half the dough? Okay, I’m clearly a beginner….but what size is a bread pan are you using and is there a standard size? Or does it not really matter? The standard size is 9×5 & that is what I used 🙂 Hope that helps! I made this bread and it turned out perfect! Yay!! Happy to hear that! Thank you for letting me know! I’ve tried baking a sandwich bread thrice before this and failed miserably .. this recipe turned out perfect though ! Fluffy bread with a delicious crust . Thank you so much for the recipe ! So, happy to hear that it turned out…especially after trying to make bread a few times. Thank you for sharing! 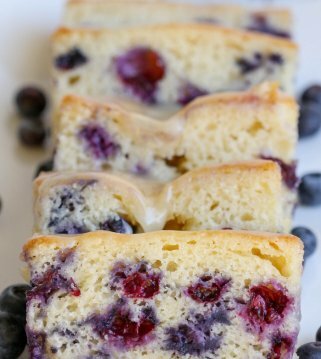 I found this recipe and I love it! My bread is perfect!! I’m going to keep it! Thanks for sharing!! If there was a way to post pics, I would! Lol. I love hearing that!! Thank you so much for letting me know! Just an interesting fact about active dried yeast. I live in South Africa and the only kind of dried yeast available here is rapid or as we call it instant yeast. To be honest I don’t like the rapid yeast as it somehow does not taste the same as active dried yeast. On 4 previous occasions I was privilege to visit the USA and of course I stocked up on active dried yeast every time. Once I got home I put it in the freezer and I am happy to say the yeast has more or less no expiry date then. All I do when I want to use yeast, take the specified amount from the bottle ( Red Star ) , put it back in the freezer and has yet to have a failure It will last a good few years. Kind Regards Elza. Thank you for sharing that! I am glad you could stock up! Love this recipe! All other breads I’ve made don’t come anywhere close to this one! Thanks for sharing! I used bread flour, there is no difference for those wondering. Thank you so much! The tips you have were awesome. I have always been afraid to this from scratch and my bread turned out heavenly…all thanks to your easy to read instructions and tips. See, no need to be afraid! So, glad it turned out! Thank you! I baked this bread today and I can not express how amazing and tasty it is.Fresh out of the oven with lots of butter,sooooo good. This is the first time I have ever baked bread. Loved how simple it was. I did mix the flours,I used half wholemeal and half plain flour,and was perfect.Thank you so much for this receipe,will be making over and over again! Oh, I am so glad!!! That’s why I love this recipe! Thanks so much for letting me know. Hey, Thank you for sharing this delicious recipe! My family loved it. Any tips/insight on why mine may have gotten heavy/dense after it cooled? Did you use kosher salt or table salt? Made this today and it was too salty. What do you use to store your bread in after it is baked? If you cut your bread in the middle and then put the pieces back together (like bookends), it will stay fresher longer. This is only my third time to bake bread, and I’m so proud of myself for this one! Your instructions are easy to follow, and the bread tastes lovely. Thank you for sharing, I don’t want to ever eat store bought again! Isn’t homemade the best?! I’m so glad you like this recipe and that it’s easy to follow. Thank you so much for sharing! Hi.. I just made your recipe. I love it. Thanks for sharing such a great recipe. Can you give me some tips for store my bread for 2, 3 days? But i don’t want to put it on fridge. Is it possible? I am so glad!! Yes, I like to store mine in a gallon size bag & make sure the air is out & I will add a tie at the end to keep the air out. Hope that helps!! OMG this bread is amazing!!! I’ve made bread before and they were just ok and the family didn’t eat it much. With this recipe, within 5hrs a full loaf was gone. Everyone one including my very picky husband gobbled it down. I did one classic plain white bread, first to go and delicious right after coming out of the oven warm with butter, the second I put a bunch of cinnamon and sugar after rolling then rolled up and baked like the first, it is equally good and if I added a frosting would taste just like a cinnamon bun. SOOOOOO good, I will for sure be making more tomorrow. Thanks for sharing, oh and mine stuck to the pan so will be using parchment paper next time. I love to hear that!! This is my favorite bread recipe! The frosting sounds like a great idea! …. (Look at that cheese sauce!)…. Whoever thought up the use of this recipe video pop-up is a genius. You are too funny!!! I’m glad you are mesmerized!! Thanks so much! Finally baked the bread. Perfect. Thanks. Hope my family comes home soon so I don’t eat it all myself. Help, everything was fine thru the second rising! When I removed the Saran Wrap, it stuck to the dough & fell flat! Oh, I am so sorry!! I’m not sure what happened!?? It could have been the yeast. Was it new or fresh? Do you need to add the sugar, or can it be optional or possible even substituted? Other than that, this sound like a great recipie and I can wait to try it! I have never left it out, so I personally can’t say how it might come out. I’m sorry. It really is the best bread 🙂 If you try, let me know what happens! Thank you! Must use the sugar. It is the catalyst for the yeast to release CO2 (raises the bread). Okay, good thing I haven’t made this bread yet. Eventually, someday, I will. Thank you for the heads up! Can’t wait to try this! Are the pans 8×4 or 9×5? Mine are 9×5. Hope that helps!! Thank you for stopping by! Thank you yes! (Even though I just saw someone asks already and you answered ???? Sorry!) Made them this morning–sooooo good!!!! I didn’t realize that it could take up to 10 minutes for the yeast to activate. I threw away the first two batches because I thought I messed up. Luckily, I texted my mom, figured it out, and baked 2 fabulous loaves of bread that didn’t last 24 hours!! It was such a hit, I just baked 4 more!! Thanks for the recipe!! Oh, sorry you threw those batches! You didn’t mess up 🙂 I am so glad you liked the bread!! We love it! Thank you! Hi there! Is there any input that you could put in on my question? 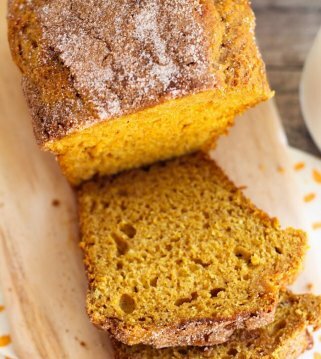 I hate to be that person, but literally every post here except mine, received an answer 🙁 I posted back in February and others received a response on the same day, so I thought I’d check back today and still no response 🙁 I love the texture of the bread in the image and how the recipe is simple. But I’d like a little input on the amount of flour. The conversion charts vary from brand to brand and just from basic usage. I’m sorry I didn’t respond. I try to answer all comments, so I might have missed this, but I am sorry. I’m not sure how to answer your question. I’m not familiar with KA flour and I don’t measure by grams, so I guess I would need to figure out how many grams are in a cup. I looked on google and it’s 120 grams per cup of all-purpose flour, which is the same as the KA flour. Did you use all 6 1/2 cups? Depending on where you live, the humidity, etc, effects cooking/baking. It took me a couple of times to get it right, so keep trying & add a little more flour next time, adding 1/2 cup at a time. I hope that helps you! I’m sorry again, for missing your comment. Good luck & let me know if you have any more questions! Hi there and thanks for the reply! I hope my post wasn’t taken the wrong way. Ohh yes, humidity. I didn’t realize that. My area is very humid 🙁 When making the bread, I did use all 6 1/2 cups per the 120g from King Arthur, but the dough was really sticky. Not similar to your images at all. So I ended up adding a whole other cup, so I used a total of 7 1/2 cups. The dough was still sticky, but the bread came out great! The two loaves were gone in two days. I’ll continue to play around with it, but thanks for a great recipe and thanks so much for responding and looking into my question! It is greatly appreciated! Just made my first batch of bread using this recipe and it was so simple and my whole family loved it. Thank you for sharing. I used my kitchen aid for the knead step….so easy!!! Goodbye store bought bread!!! Yay!! Yes, you’ll never go back now 🙂 Thank you for letting me know! thank you for this easy recipe! i used 3 1/2c white flour and 2c whole wheat flour and it came out perfect! put the second loaf in the freezer after the first rise (punched it down, rolled it, covered in saran wrap, then put in freezer bag). will post to update on how that one comes out. You are so welcome! Yes, I’d love to know! Thanks! Ive made this several times! All 5 of my kids and husband love it! Its really hard to find some thing they all even like. It makes the perfect French toast. Love to hear that!! This is by far our favorite bread recipe & yes, perfect for so many things! Thank you! When making I didn’t even use the whole 4 cups it started with? Dough felt perfect without it… We’ll see how it turns out I guess! How did it turn out? I hope you liked it!! Let me say this you are so sweet that you answer each and every question so so sweetly. Turned out wonderful. Could use a bit more salt. But otherwise wonderful recipe. A keeper. Thank you!! It is our favorite!! Hope you’ll try it 🙂 Thank you! What brand of mixer did you use? Looks so easy. I make it in a bog bowl 🙂 You could use whatever you have around..any would be fine. Thank you! Super excited about this bread which is in the middle of the first rise!! I used coconut oil it didn’t specify and figured what the heck so hoping it turns out well!! Any experience using coconut oil?? I haven’t used it a whole lot. How did it turn out? It turned out so yummy with the coconut oil!! I am actually making another batch if them right now I plan to do what another commenter did adding cinnamon and sugar to one!! The other will stay plain for sandwiches!! I also made it with avocado oil and had great results as well!! Love this recipe!! It’s so easy yet delicious! That’s so great!! Thank you so much for sharing!! It looks like a really nice recipe and my dough is rising in the pans at the moment. What I’ve been asking myself, still I’m.not from US: how much is one cup of flour? I found recommendations between 100 and 150 grams? The dough is really sticky, when you knead it by hand, do you do so in a bowl? Or on a floured surface? Does it stick to your hands or is it dry and floury on the outside? And when you roll out the dough, do you flour the surface? Or oil it? Or just put it there without any preparation? How thick is your dough rolled out? Sorry for the many questions since I’m new to baking. And sorry for my may a little off english, not my first language, but I’m trying. 1 cup of flour is about 140 grams. The dough shouldn’t be too sticky, where you can’t roll it into a ball. It should be tacky, but not sticky. You can knead it in a bowl or on a slightly floured surface. It’s about 1/4 in thick-1/2 in. It doesn’t have to be exact. I hope I answered all your questions. Good luck & let me know if you have any other questions! Most of it I did right instinctively. One loaf didn’t come out ao well. I had two different sizes of pans and divided the two ao it fit both parts. But in the larger one it started to fall down again before it could reach the edge of teh pan. Baked it anyway, was a bit flat, but definitely delicious! I do have indeed one question left. Why do you use dry yeast (actually in all the recipes I found?) it works so much better with fresh yeast! My grandma made potato bread always just boils one potato to make bread do you have a recipe? I am sorry, I don’t . Sounds interesting, though! Hope you find a recipe! I came across this recipe and wanting to try it. I had been very hesitant to try because i always have a hard time getting the dough to rise and come out looking like an actual loaf of bread. Decided to try this with a small trick my mother in law told me about. When getting the dough to rise just put it on a heating pad on low. I’ve never heard of rolling the dough out either but WOW…this bread turned out AMAZING! My house smells sooo yummy and the kids won’t leave it alone! Guess I’ve found the new favorite for the house! Yay!!! Love hearing that!! Thanks so much! Do you think instead of baking 2 loaves you could bake 1 loaf of bread and the other half make into cinnamon rolls? I am sure you could!! I haven’t tried, but I don’t see why not 🙂 Good luck! Can this recipe for home made bread be done in a bread machine? I personally haven’t, but I’m sure you could 🙂 Let me know how it turns out & I hope you like it! I used to make homemade breads & noodles by hand(no machines) growing up on the ranch. Live in Nebraska. Only got 4cups total into the bread. When I finished my kneading for the 1st rise it was smooth but not so much tacky anymore…ALMOST like I put in too much flour? Smooth & a little dry(not tacky)but not where it’s dry cracking or clump separating. I saw Laura was the ONLY one so far that I saw who didn’t get past 4cups total but didn’t see how it turned out. Ever made it w/only 4c flour? Should I just make 1 loaf depending on the 1st rise? I have a metal, glass & stone pans for loaves…wonder if I should make it in my large stone pan as one loaf. Thoughts? I’ve made this bread so many times. It’s my favorite bread I’ve EVER made! Sooooo good and fluffy! I’ve got two loafs rising right now that I plan on vacuum sealing and freezing ???????? For some reason it won’t let me rate it but for sure 5+++ stars!!!! ???? Awe, thank you so much!! I’m so glad you like it!! Do you have any bread recipes for Bread machines? Made this bread today…I can’t wait for my husband to finish it so I can make more…it is so delicious. LOL!!! Why do you think I make lots of loaves at once? It’s never enough! Thank you! totally made this and it was great!!! thanks so much! Great!! Thank you so much for sharing! I am glad you liked it! hi, i am from Pakistan i want to know that how can i make it little bit sweat. actually my childrean likes sweat milky bread. What kind of flour do you use to make this bread? Hi! What kind of mixer is used in the video? Oh, it isn’t mine. I will have to find out! I love this recipe . when I make my bread I always use this recipe always .if u don’t have a warm place for it to rise . I used my oven setting it on 120 to 150 degrees and it turned out nicely for me . Thanks so much for sharing Minnie! I am so glad you like it! What brand of electric mixer do you use in this video? Yes, you did!!! You should be proud 🙂 Thanks so much for letting me know! Hey there! I’m very new to baking anything other then boxed cake mixes and muffins :(, but I’m trying to make everything homemade now! I only have Quick-Rise Instant yeast. Will this work? Very, very new to the whole yeast thing. Thank you! Watching th video and it looks amazing! What mixer are you using? I was looking for a good bread mixer! We now buy flour instead of bread! Thank you for sharing! Love the bread! You are so welcome! It’s our favorite! Let me know if you do..I’d love to know what you think 🙂 Thanks! Just made this and they turned out perfect! Didn’t change a thing I’ll definitely be using this recipe again! I’m so glad it did!! Thank you for letting me know!! Hi..please can yu give the measurements in grams ?. This was the first time I’ve ever made homemade bread. It was so amazing. My entire family LOVE it, requesting I make bread for the holidays. Yay!! Love to hear that! It’s our favorite bread recipe! Thanks so much for sharing! My bread wasn’t as light as your picture…heavier in texture. It was still super soft, but just much heavier. When I sliced it, the bread height wasn’t as high as typical sandwich bread either, and your picture looks like it should be about the same size. If mine had turned out that height, it would’ve taken FOREVER to get done in the center due to it’s heaviness. I followed the recipe completely. Any thoughts or suggestions? I’m looking for fluffiness with a full bodied taste. Is that possible? I tried this recipe for the first time today, and it was the best bread I ever made. The author took the time to post step by step directions, and tips, that made all the difference. I added four cups of flour, and then began adding more flour in small handfuls as I kneaded the dough…. Keep adding flour until the dough just barely sticks to the surface you are kneading on. The consistency of the dough is of prime importance. If you like a lighter fluffier bread then add a bit more flour. I prefer mine a bit more moist and dense so I used around 5 3/4 cups in total. Just follow the authors directions and you can not go wrong! I just used all purpose flour 🙂 ENJOY! This looks so easy. I am going to give it a try. Thank you. I have a question – Do you use bread flour, self-rising or all purpose flour? Thank you. It really is super easy 🙂 I just use all purpose flour 🙂 Good luck! I’m happy to hear that! Thanks for letting me know! Love hearing that! It’s great for so many things 🙂 Thanks so much! Thank you so much!! This is absolutely our favorite! I’m so glad you all liked it! This bread turned out amazing! It is such a simple recipe. My husband and I won’t be buying bread from the store anymore after trying this!! Thank you so much for sharing. Yay!! We never have to buy bread either 🙂 I’m glad you liked it! Thank you! Alicia, this bread looks beautiful and perfect! I’m going to make it the first chance I get! Will rapid rise yeast work in this recipe? Yes, but I’ve only used the active yeast, but if you are familiar with the rapid rise, you could try it. That makes me so happy to hear!! Yes, this is our favorite!! Thank you so much for letting me know! No matter what yeast I use it never seems to bubble up like your pictures… I just font know what I’m doing wrong. I’m sorry you are having problems! Sometimes it bubbles & sometimes I don’t wait for it to bubble. Make sure your water is between warm & hot. Have you tried all kinds of yeast? I use the instant yeast, if that helps! Isn’t it the best?! I’m glad you like it! Thank you so much! made this bread tonight for cinnamon rolls! love love love!!! Yay!! So happy to hear that! Thank you so much for giving them a try & great idea for cinnamon rolls! I make this bread every week. Started out with two loaves, and now we’re up to 3 White loaves, 2 cinnamon loaves and 12 dinner rolls each week. Thank you so much for sharing the recipe!!! Love hearing that!! Sounds yum! Thank you for letting me know! Can you use a sour dough starter for this recipe? I’m trying to avoid the dry yeast. Thanks! I personally haven’t tried, so I’m not quite sure. I would think you could do that as an option. Did you try it? Everything seemed to be going right, up until now… the loaves are currently resting in the loaf pans but they don’t seem to be rising and it has almost been an hour. What am I doing wrong? Maybe the yeast was bad? I just bought it at the store! Thanks! Thanks! I’m gonna give it another shot with some new yeast ???? In your recipe you say 5 1/2 to 6 1/2 cups of flour. I will be a first time bread maker and I am not sure what will happen if i do one or the other measurement. and does it matter what type of oil i use? i.e. veg, canola etc.. Thank you for your feedback! I like to start by adding half of the flour at first, then add 1/2 cup at a time, until the right consistency. You can’t take out flour, but you could always add more. And, you could just use vegetable oil, though I’m sure any is fine 🙂 Good luck! I only have a hand mixer in my kitchen with beater attachments. Can you mix all the stuff by hand or something? What kinda nd of flour, all purpose or self rising? All-purpose 🙂 You are welcome! Tried this recipe today and it turned out great!!! Woohoo!! Isn’t it the best?! Thank you so much! I wish I knew. Someone did the video for me. I get lots of questions about it! I guess I better find out! Made this bread, EXCELLENT ! Two loaves didn’t last the dinner! Very easy and delicious. LOL..it never lasts long!! Thank you for letting me know & I’m so glad you gave it a try! I was wondering what kind of mixer you were using to mix your bread recipe. Might give this one a go to compare. I am sure either way, they are both fantastic as Home Made Bread has no equal, for sure. This is an awesome recipe! Honestly when read I “flour” in the recipe I assumed bread flour, so that’s what I used and it turned out great. I read online that the only real difference is bread flour has a higher protein content. It made 2 fluffy and soft, yet dense loaves that my family loves. I am able to make slices for school lunches, even peanut butter and marshmallow fluff won’t tear the bread while spreading! The only other things I changed was while preparing the yeast I did a swirl once around the bowl with honey, instead of the pinch of sugar, and I used olive oil instead of vegetable. I’ll definitely be making this bread for years to come! Thanks for sharing your changes! They sound perfect! I am so glad you like the bread! My one year old has several food allergies so I was on the hunt for a homemade bread for him. I have to admit i was very nervous, but this was super easy with all your pictures. The bread is AMAZING! Everyone in the family is eating it now and it was actually requested as Christmas gifts by friends instead of cookies this year. Thank you so much for posting. Yay!! I love hearing things like that! Thank you for sharing! Well, I am glad you liked it 🙂 I would spray the saran wrap or I like to use a kitchen towel to cover it. Hi do you think I bake a bread with Sam ingredients in a breadmaker. This is my first bread making experience. Thanks KS for sharing your recipe! I don’t have a fancy bread mixer. I thought I would be fine with that I had and my hands, but the dough just didn’t rise like it should have. I’m currently waiting for the loaves to rise so I can throw them in the oven. They are on the hour mark right now and have barely moved. Were my tools just not right, you think? I use my hands..they are the best tools 🙂 How did it turn out? WOW! This bread is the BOMB! Even with a few of changes I made due to what I had on hand and our personal taste. I used 1/4 cup of ground flax for part of the flour, and reduced the sugar to 3 Tblsp. I didn’t have anything but quick rise yeast, so I upped that amount to a heaping tablespoon and it rose beautifully – TWICE! Since I don’t have a stand mixer, I just kneaded it for about 15 minutes. It was still a teeny tad tacky but I left it that way…and so glad I did. It was just the right amount of moist, soft and had a beautiful crumb. Hubs and I went thru a whole loaf in one day. This is now my go-to recipe. Thank you for posting this great, versatile recipe! I made your basic bread recipe yesterday! Oh my goodness! Definitely the best bread recipe I’ve ever used. The recipe is SO easy and finished bread should carry a warning….’ very very moreish’. Thank you for publishing this recipe….I’ll be making bread frequently now! Haha!! Love it! Thank you so much for sharing! Making this bread for the first time today and my first time ever….but my bread isnt rising in the tins!?!? ???? A little bit? I think I will retry another day with some different yeast. It could have been bad or may have not let it sit long enough. Hope it works the second time! Do you think this bread be made with a Pullman lidded loaf pan? Thanks! Good question?? I haven’t tried, but I would think so?? I made this bread last night and it is so yummy! I only made one loaf and used the second portion to make cinnamon rolls! This is the easiest recipe to pull together. I make it once a week for my . Everyone loves it. I absolutely love this recipe! This was my first time making bread & it turned out awesome. I’ve tried other roll recipes & they turned out ok but from now on, this is our bread for any meal. Love it! Yay!! I’m happy to hear that! Thank you! Great idea!! I am so glad you like it!! Thank you for sharing! It is definitely a treat when someone makes it! Thank you for stopping by! I made the bread and followed to a t. Looked amazing when baked but when i sliced it it basically unraveled. Air pockets between my layers from rolling. What could have caused this? Not rolling tightly? Or didnt pat down enough? Tasted amazing but didn’t slice well. I definately want to try it again. Can you not roll it and just put it in pan? Have you ever tried to punch the dough down twice and do a double rise before putting it in the pan for a final rise? My 90 year old mother who baked her own bread for 70 years said she did it that way. She also started her yeast in a cup of water with the pinch of sugar, put all the dry ingredients into the bowl mixed them up then added the water and then the foaming yeast. She said this kept the salt from being concentrated with the yeast and possibly killing it. I mix my dough this way and have had good results, starting with half the flower and adding more as I stir. I stir by hand with a wooden spoon. I will try the double rise on my next batch. I’ll have to try that. Thank you for sharing! My whole family is in love with this bread it is absolutely fabulous. Thank you for allowing us to have this recipe. I am so glad to share it!! 🙂 I am also glad you all love it! Thank you! Just wanted to say thanks as this has become my go to sandwich bread every week. I no longer buy store bread. Due to an autoimmune that I acquired, processed foods are less desirable. So your bread has become a lifesaver. Thank you! Love to hear that!! We use this bread for so many things! I’m glad you like it!! Thank you! This is my go to recipe for bread! Just wanted to let you know, I mix everything in a food processor, quick and easy and it comes out perfect every time! Thank you for letting me know!! Yes, we love it too for so many things! I am so glad you like it! Can you add other seasonings to the dough like garlic powder? You sure could. I haven’t tried adding garlic powder, but that sounds like a good idea! It turned out really well! The butter touch was amazing! It made the bread so soft! What kind of oil? And could you substitute it easily, maybe melted butter, coconut oil? I just use vegetable oil. I haven’t tried the others. Has anyone else? I just made your bread and it did take longer than 35 mins. I’m just wondering which rack did you bake it on cause I made it on the second from the top rack. I use the middle 🙂 All ovens vary, so it’s ok if it takes longer or shorter. Did you like it? I absolutely love it!!! Was a huge hit with my family! Practically wolfed down the first load in minutes! Woohoo!! So glad! Thank you! Hello, I’m new to baking and I was wondering if I could use “bread flour” instead of All purpose. Thanks! I’m sure you could, I personally haven’t tried, but I don’t see why you couldn’t 🙂 Good luck!! Yay!! I love to hear that! My kids love it, too! Thank you! I tried this recipe today. It was simple and turned out great! I was little nervous because my dough seemed too sticky, but all turned out well. Thank you for sharing this recipe! Yay!! So happy it did! Thank you so much for letting me know! It wasn’t mine 🙁 I’m not even sure?? thank you for the recipe and i’ll definitely try your recipe. than you. Are you able to sub out the white flour in this recipe for almond or coconut flour to make it gluten free? What kind of oil do you recommend? I’ve never made bread and have little baking experience. Thank you for the recipe! I just use vegetable oil 🙂 Good luck & let me know how it turns out! I used light flavored olive oil. Turned out great! Wonderful recipe. Thanks so much for sharing!! So, glad you like it! We have not bought bread for 3 months or more!! This recipe is fabulous! First rise on my next batch is going right now and I will be making buns for bbq out of 1/2 of it. That is so awesome to hear!! Thank you so much for letting me know! We love this bread so much! I used bread flour and it turned out great. This is a wonderful bread recipe, thanks for passing it along! You are so welcome!! Thank you for sharing that!! This is my first time baking bread..
What modification do I need to do if I use instant dry yeast ? Yes, I believe the instant can be dissolved right in the dough, as the active needs to be dissolved in water first. Hope that helps! Good luck! Hey! So I’ve always been afraid to make bread but I finally did. I love the flavor but my bread browned more on the bottom and was more ashy on top. Also my outside crust seemed harder than yours looks. I am glad you tried!! It takes practice, for the best bread! You’ll get there 🙂 Thanks for sharing! This bread sounds wonderful. Is there a way to convert it to making it in a bread machine? Thank you. I haven’t made it in a bread machine, so I am not quite sure what you would need to do. We do it old fashioned way 🙂 I would think you do it the same way as far as mixing it together. i made this bread for the first time back in November 2017 & I absolutely love it. I’ve never made bread before this recipe & it turned out great. I use this recipe at least 3 times a month now. I’m so happy to hear that! I have not tried using honey, so personally, I am not sure how that will turn out. I’m sorry! I will have to experiment. I love cooking so I need yummy things to cook. I hope you found some good ones to try 🙂 Hope you like them all! I’ve been using your recipe for a year now. I never even made bread before and everyone LOVES this bread. This is our favorite!! I am so glad you make it & everyone loves it! Thank you! What size bread pan do you use? Also, can I use the jar of “bread machine” yeast? If yes, how much do I use? I use the 9×5 or the 8 1/2 x 4 1/2. I’ve used both. I haven’t tried using the bread machine yeast, but if you are familiar with it & know how to use it, I’m guessing it should be ok 🙂 Hope that helps! I am on my 3rd batch of this wonderful bread! My yeast was not getting bubbly or foamy, but I didn’t have any measuring spoons so I guessed t the amount of sugar. After I read the other comments I added more sugar for my yeast to feed off of and it did the trick . My first batch I was in Southern California and didn’t want to die of heat , so I made them in my toaster oven. They came out really good , except the top got too dark cause the dough had risen so high ( wonders happen when you have the right tools) but never the less they came out so good. Thank you for this recipe I am now living in Rosarito Mexico making your bread down here my neighbor came over to see what smelled so good, so I had to give her a loaf when it was done. She said her and her husband had some for dinner and toasted it with homemade jam is morning. I am so glad it turned out! I love hearing about your neighbor!! It really does smell so good! Thank you! I haven’t tried, but you sure could 🙂 Hope you like it! Awe, thank you so much!! This is our favorite! Glad you liked it! I made BLT’s with it! Just making sure 1 Tablespoon of salt? I made this tonight but I thought perhaps that was a lot of salt so I did 2 teaspoons of salt. It turned out well. My family devoured the first loaf in a matter of minutes. Hard to cut when HOT. Lol. Yes, but if 2 tsp worked, then that is good to know 🙂 Yes, they get devoured fast!! Thank you! I use all purpose, but I am sure others would be fine, though I haven’t tried myself. I could eat a whole loaf of this bread all by myself! It is SO good! Hi Lil Luna I was wandering since I don’t have a stand mixer can I just mix by hands?? How much is the yeast expected to bubble? I have a pretty high concentrating of bubbles/foam in the center but it gets clearer as the radius increases. MAde this recipe twice. My second rise is a flop both tines any SUGGESTIONS? Didn’t rise at all the second time, but did the first time? Hmmm..that’s a good question! You followed everything exactly? Theres nothing more comforting than bread coming out of the oven. The smell and taste is heavenly. We like it slathered in butter and the next day as toasT. This is the best bread!! I was afraid to try it, since I’ve never made bread, but it turned out perfectly!! It is so soft & I can use it for so many other recipes! Woohoo!! Thank you so much for letting me know that! I am so glad you tried it & loved it! This is my fourth time using this recipe! Yummy anD so so simple! I doubled the iNGreDients and placed the two addItional loaves in the freezer after the fIRst rise. (Wrapping them individually in plastic wrap.) The freezer loaves rose perfect and tUrneD out beautiful! Now i always have bread on hand, Thanks for the great recipe! this is by far my favorite bread to eat! so easy to make! I made This today! Ive never made bread- i did have To get a fresher yeast but your directions were easy and never once did i QUESTION if i was doinG it right!!! My girls love it! Thank you! Im making this bread tonite for the first time. Waiting on it to rise for the 2nd time . I cant wait to taste it ! It’s my favorite! Hope you like it!! I found your recipe via pinterest and the time listed was a total time of 45 minutes. I clicked wanting to know how in the world you make a loaf of bread in 45 minutes because that sounds like the recipe I want. I realized you have rising time for 2 hours but did not include this time in the total, which is rather misleading and quite important in my opinion. Other than that Your recipe sounds delicious and I’m going to give it a try when I have a bit more time. 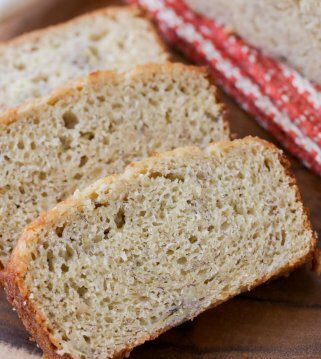 Do you happen to have a recipe for quick bread for people SHORt hours in the day? I decided on a whim this snowy Sunday morning to make some sandwich bread, since were all out. This recipe has simple ingredients that i had on hand, so i went for it. Im an experienced bread baker, but Usually in the form of rolls. This bread came together quickly and baked beautifully! Definitely a keeper for sure! I am so happy to hear that!! Thank you for trying it! Thank you for this WONDERFUL recipe! I made this for the first time toNight and it came out perfect! I did Use bread flour instead of AP flour and did an eGg wash at the second pRove, but man this bread is DELICIOUS! I also proved a little longer than reCommended but not by much. This is my new go to recipe. Thank You again For SHARING it!! Literally so dang addicting! Thanks for a cozy bread recipe that is easy and delicious. Warm bread is my weakness! Haha..mine too! Thank you so much for sharing that! The bread came out fluffy. The taste was spot on. The texture was too chewy though. Any idea why? What can I do to prevent it from being too chewy next time? By the way, I don’t have a stand mixer so I made it by hand. Baked for 30 minutes. It was perfectly baked. There’s nothing better than a slice of warm homemade bread with butter. My family can inhale an entire loaf of this stuff in about 5 minutes flat. So yummy! Love how simple this recipe is! We make several loaves and freeze them for the month. I love a great bread recipe! thank you! ya know, the title is actually pretty correct. I’m skeptical of “best ever” stuff but this bread was spectacular. Oh, I am so glad to hear that! Thank you so much! This recipe looks amazing. Seen many comments on substituting whole wheat flour and that it worked wOnderfully. Which I will DEFINITELY try. Any experience with replacing With rye flOur. Oh, I haven’t tried the rye flour. I’m not too familiar with that flour. Worked perfectly every time. Love it. Thank you! Yay!! I am happy to hear 🙂 Thank you! If I could give this 10 stars I would. What an easy bread recipe. I have made buns before but not bread. Followed the recipe to a t and it is so good. We just had a sandwich with it and omg I could eat the whole loaf. Already put the other loaf in the freezer so I don’t eat it all. Thank you so much for the recipe. I will use it OFTEN. Soooooo soft and delicious. LOL! I could eat the whole loaf too!! I am so glad you liked it! Thank you so much! Ambient temp for the rises? Water should be warm, not hot & I am not sure about a temp, but I like to let rise under the oven light, on top of the stove. I made this with a pastry-style bread flour. My FAMILY raved About. Thank you for SHARING an excellent anD easy to follow recipe! Yay!! Glad to hear 🙂 Thank you for letting me know! What mixer do you use? what machine are you using to mix the dough? Made this bread and it tu out perfect. I will Definitely be making this again. I am glad to hear that!! Thank you for letting me know! I haven’t tried, but you could before baking, I would think 🙂 Enjoy! I haven’t TRIED MAKING IT YET….I DO NO HAVE A STAND ALONE MIXER …. CAN I MAKE THIS WITHOUT ONE? Yes, you sure could 🙂 I usually use my hands! Hello!! What is the machine you are using to mix the dough? I would love one of those For my breads as Opposed to my standard machine mixer. Thanks!!!! This is a bosch 🙂 I use my hands, but we used this for the video. You us ksome kind of a bread mixer , what kind is it. Amazing! SO sImple and easy. MIne came oUt perfect. I Would also like to know if this info is accurate as well. I have a question… can i use this recipe for my zojirushi bread maker? My first batch of bread ever made was this recipe. It turned out perfectly. The boys were happy and ate the entire loaf! Best bread recipe I have seen.made it and husband loved it. That makes me so happy to hear 🙂 Thank you so much for letting me know! Oh, no, I am sorry. There are a few reasons bread will sink…too much moisture, allowing to rise to long, inaccurate measure of dry-goods, there could be more. I am sorry, I wish I knew what exactly happened to yours. Did any if these happen? would you have any suggestions if I substitute with gluten free flour? Hi! I’m excited to try the recipe, but I only have instant yeast on hand. Would I still need to follow the same steps? How would you go about preparing the bread with instant yeast? You wouldn’t need to dissolve the instant in the water first & it just might rise quicker. Made this yesterday, it was delicious! Thank you for trying it!! I am so glad you liked it! I’ve made bread many times before, but last night I decided to try this recipe and it’s seriously the best sandwich bread I’ve ever made! The texture and flavour are both perfect, and the tips about rolling the bread out and then rolling them up into the loaf shapes really made them beautiful. Thank you so much for the recipe; it’s definitely my go-to recipe for sandwich bread from now on. You are so welcome! Thank you for saying that! It is perfect for sandwiches! Amazing bread! Made it once and my hubby has asked that I make it on a regular basis!!! love it – just starting to make it again today and I wanted to leave this comment because if you are ever hesitant to make homemade bread – this is the recipe for you – so simple and amazing!!!!!!!! Awe, thank you so much for saying that!! I am so glad it’s a hit at your house!! Thank you so much for posting this bread recipe. I make bread all the time and this is the best white Bread recipe I have ever made ! Yay!! I love to hear that!! Thank you so much for sharing that! This recipe was so easy to follow. my first loaf didn’t turn out the best, but that is my fault. I didn’t coat the cling wrap with cooking spray first and it stuck during my second rise. The loaf turned out very dense, but still tasty. I froze the second loaf while it was still dough, and just cooked it up last night, but as an added twist, I rolled it out and put a cinnamon butter mixture to make a cinnamon swirl loaf. going to heat it up this morning as a breakfast treat, while I make a second batch of dough. Going forward, I plan on making my own bread, since store bought bread contains soy, and my husband has an intolerance to soy that we just recently discovered. and he loves fresh baked bread…who DOESN’T’ right? I know I love fresh, baked bread better!! Thank you for trying it! Adding the cinnamon butter sounds perfect! If i am making this in a bread machiNe, how long do i knead it and on what setting?